Get cooking today with this convenient, effective, and high-performance electric cooktop from Electrolux. The cooktop features 4 radiant elements, including a Flex-2-Fit® element that adjusts to 3 sizes, allowing it to accommodate a wide variety of cookware and cooking techniques. The intuitive Glide-2-Set® controls make operating the unit easy and precise, and the ceramic glass surface is both attractive and easy to clean. 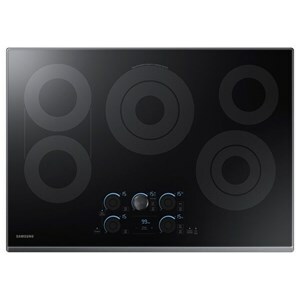 Get started on your next culinary masterpiece with this phenomenal cooktop in your home today! The Electric Cooktops 30" Drop-In Electric Cooktop with Flex-2-Fit® Elements by Electrolux at Colder's Furniture and Appliance in the Milwaukee, West Allis, Oak Creek, Delafield, Grafton, and Waukesha, WI area. Product availability may vary. Contact us for the most current availability on this product. Featuring innovative design and easy-to-clean surfaces, Electrolux cooktops deliver style and performance in every aspect. And the Induction Hybrid can boil water in 90 seconds, making it our most innovative model. The Electric Cooktops collection is a great option if you are looking for Appliances in the Milwaukee, West Allis, Oak Creek, Delafield, Grafton, and Waukesha, WI area. Browse other items in the Electric Cooktops collection from Colder's Furniture and Appliance in the Milwaukee, West Allis, Oak Creek, Delafield, Grafton, and Waukesha, WI area.